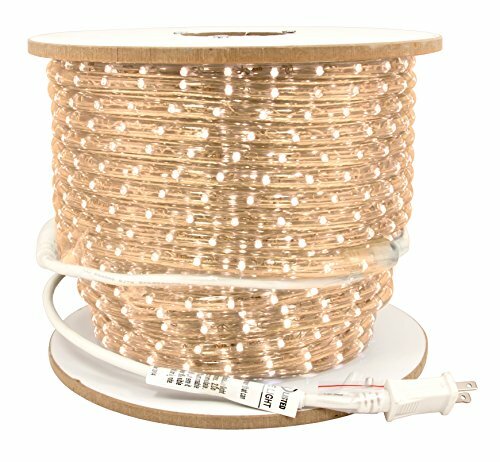 American Lighting ULRL-LED-WW-150 LED Rope Light Bulk Reels, Dimmable, 1-Watt and 32 Lumens per Foot, 120V, 1/2-Inch Diameter, 36-Inch Cut, 150-Foot, Warm White. American Lightings LED rope light bulk reels are economical and versatile! Use for energy efficient accent light, outlines, railings, steps, coves, patios, gazebos, wine cellars, retail displays and more. These vibrant, long lasting colors that will grab your attention, produce virtually no heat for maximum safety! Dimmable with most CFL/LED and low voltage electronic dimmers. Bulk reels can be field cut for maximum project flexibility (ULRL-LED UL listing becomes void if rope is cut). UV resistant clear PVC housing with LEDs spaced every 1-inch, mount vertically. Multiple voltages, diameters and color options available. In any indoor installation, all conductors must be coated with dielectric grease, and properly sealed with silicone and shrink tube. Switched wall outlets cannot be used with wall dimmers per the NEC. Founded in 1989, American Lighting, Inc. manufactures a wide range of lighting solutions for your residential, commercial and specialty lighting needs. We pride ourselves in being a lighting solutions provider by offering our customers a broad line of innovative and high quality lighting products. Continued innovation is a core strategic initiative at American Lighting, and we are committed to developing new products by utilizing the latest lighting technologies and designs. We pledge to deliver superior customer service by employing and training a team of highly experienced lighting professionals.